The official music video for ‘Hiccup’ is scheduled for worldwide release within the next few weeks. Thanks to the support of his loyal Technicians, TECH N9NE made it to the final round of TheBoomBox.com’s “Underground Kings” competition! This week, Tech is battling Immortal Technique for the win. Vote now as the current round ends tomorrow (November 20th) at 3:59PM Eastern time. Before you log-off, check out CraveOnline.com’s new video interview with TECH N9NE and Therapy producer Ross Robinson here, as well as another Therapy duo interview via LA Music Blog, here. On Tuesday, November 5th, TECH N9NE released the highly-anticipated new Therapy EP, which features new singles ‘Hiccup’ and ‘Public School’. 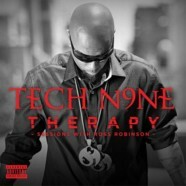 During its first week of release, Therapy landed within the Top 5 on both the iTunes and Amazon Hip-Hop/Rap charts. Therapy is produced by legendary rock producer Ross Robinson (Korn, Slipknot) and features top-notch musicians such as renowned metal guitarist Wes Borland and Glassjaw’s Sammy Siegler. Order your copy now via iTunes at this link! Since first bursting on to the scene in 1990, TECH N9NE has risen through the ranks to become the most successful independent rapper. He’s sold over two million records, garnered universal critical acclaim, scored a gold record for the single ‘Caribou Lou’, been sought out for collaborations by everybody from Lil Wayne to Five Finger Death Punch, and packed venues worldwide. TECH’s latest studio album Something Else debuted #4 on Billboard 200 this past August, and was just named in Forbes’ Hip-Hop Cash Kings alongside Sean “Diddy” Combs, Dr. Dre and Jay-Z. Forbes also gave an exclusive look into TECH N9NE and Strange Music’s indie empire in this breakout feature (check it out here).